From the days of powering lesser-known brands to becoming the uncontested champion of the mobile market – Android OS has come a long way. The journey has not been easy for the mobile software platform, but the climactic shift in the purpose, design, and working of Android under the guidance of Google has evolved it into something truly remarkable. Now that Android OS has cleared more than a decade since its existence, Android 9 Pie stands as the latest and greatest feat in mobile software. 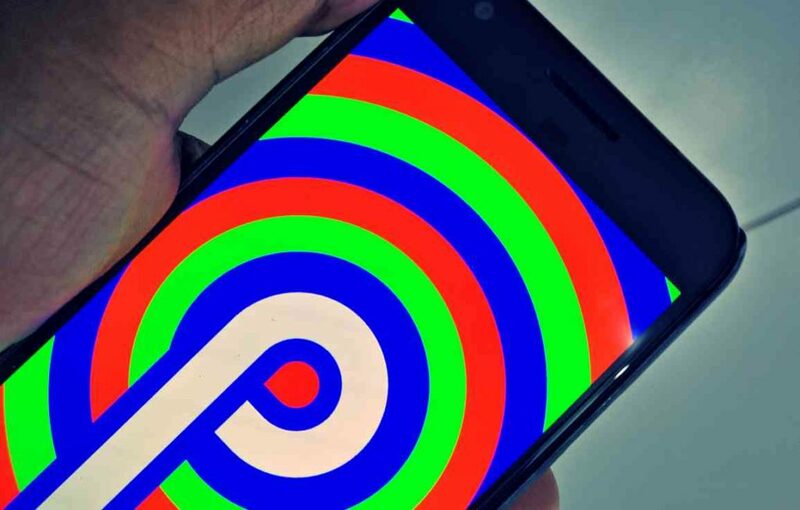 From the serious push made by Google to integrate DeepMind AI into the core of the latest version of Android OS, to the slew of design updates that are being touted, Android Pie has plenty of impressive features to flaunt. However, with all of these great features, we tend to forget that this single piece of software is expected to run on millions of devices, which is basically a recipe for trouble. Whether you’re sporting a Google Pixel that was the first to receive the major update, or getting the beta update for your Galaxy S9 right now, there are plenty of issues that could arise while you taste the goodness of Android Pie. We’ve browsed through the user forums to find the issues that mostly affect users across the Android community running Android 9 Pie. If you’re among the poor souls troubled by the latest version that Android has to offer, these common solutions to the gravest Android 9 Pie issues are just what you need. Ever since the beta update for Android Pie begin rolling out the Google Pixel line of devices, Wi-Fi issues have been reported by loads. While the problem has been resolved almost entirely for Pixel devices, Android OEM brands that are now beginning to receive Android 9 seem to report issues with drop in connectivity, poor signal strength and more. 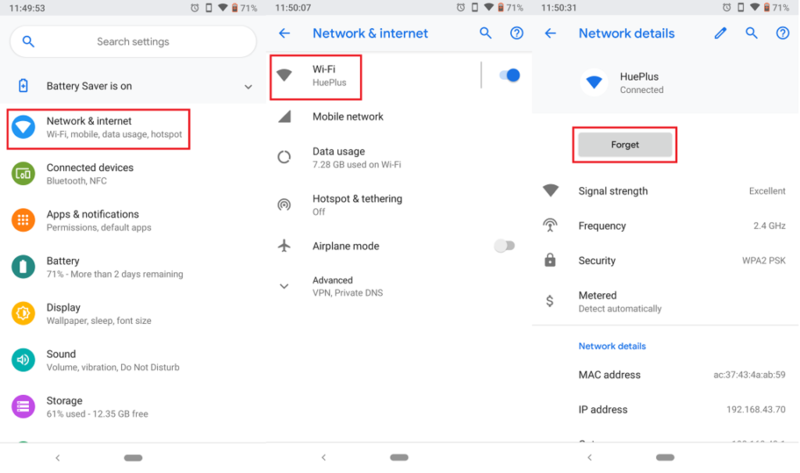 Start off with the simplest fix to resolving Wi-Fi connectivity issues on Android by turning off and then turning on the Wi-Fi toggle switch. Head over to Settings – Network & internet and turn off the toggle switch next to Use Wi-Fi tab. You can then turn on the toggle switch to connect with the wireless network and check to see if the issue has been resolved. Under certain circumstances, it could be your wireless router that is causing the Wi-Fi issues with your Android device. Simply unplug and then re-plug your Wi-Fi router after 10 seconds to perform a soft reset, which would eliminate any general connectivity issues. If you are having issues with a specific wireless network, removing it from the saved networks and then adding it again could solve the issue for good. Head over to Settings – Network & internet – Wi-Fi and then select the wireless network you’re having troubles with. Press the Forget button and then re-add the Wi-Fi network from the same menu to see if the issue has been resolved. The first thing you can do to begin with is toggle off the Bluetooth feature and then toggle it on again to see if the issue has been resolved. Slide down to view the Quick Settings paneland press the Bluetooth button to turn it on, and then press it again to turn it off. You may need to unpair your Android 9 Pie device from Bluetooth devices that you’re having issues with and then pair them again. To do so, head over to Settings – Connected devices – Previously connected devices to view the devices you’re paired with already. Tap on the Bluetooth device you’re having issues with, press the gear icon right next to it and select the Forget button to remove it from the saved devices. 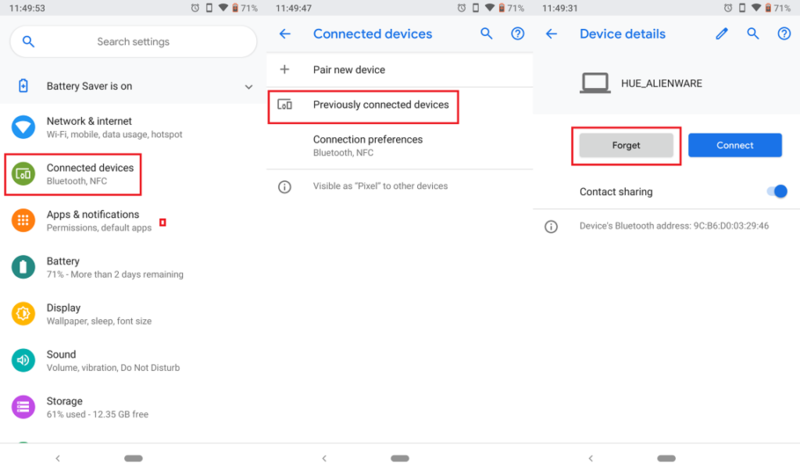 Finally, if none of these solutions seem to help you with the Wi-Fi and Bluetooth problems on your Android Pie device, the only solution left is to reset the network settings. Head over to Settings – System – Advanced – Reset options and select the Reset Wi-Fi, mobile & Bluetooth tab. Press the Reset settings button to confirm your action, which will remove all of the saved Wi-Fi networks, Bluetooth devices, and mobile network settings. Press the OK button to confirm your action and reset the network settings for the device. Another recurring issue with Android Pie devices has been the poor battery performance, which is disappointing considering features like Adaptive Battery that should be offering longer screen-on time instead. Not only has the battery issue reported by early Google Pixel users, but seems to be a pain point with Galaxy devices receiving the Android 9 update in beta right now. If you have any third-party device management apps installed on your phone, it might be time to ditch them. These apps aren’t usually optimized to work with the latest version of Android OS and end up draining more power instead of saving battery. To do this, simply head over to Settings – Apps & notifications – See all apps and uninstall the battery management app. 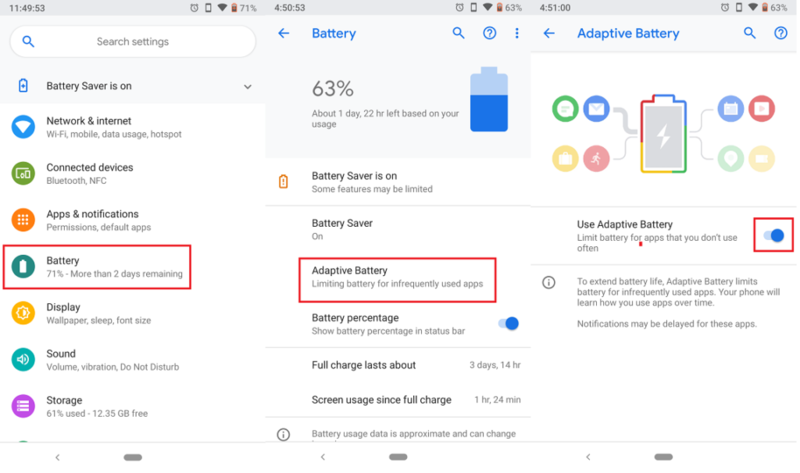 Using the battery optimization feature on Android Pie devices called Adaptive Battery can help conserve battery and increase screen-on time by hours. To turn on the feature, go to Settings – Battery – Adaptive Battery – Use Adaptive Battery and enable the toggle switch. Uninstalling any app that seems to be draining too much battery capacity is a good place to start too. You can find apps and games that are depleting the battery life of your phone by heading to Settings – Battery and tap on the three-dot menu button to select the Battery usage option. Check the list to see which app is consuming most of the battery and if you notice any non-essential app which is hogging the battery, it might be time to get rid of it. Head over to Settings – Apps & notifications – See all apps and uninstall the app which is impacting the battery life. Your Android 9 Pie device is probably a new one and will hardly give you system issues that most devices do after a year of use. However, if you are experiencing issues such as random reboots, frequent app crashes, and screen freezing issues every now and then on your Android Pie device, using the basic reset methods is just what you need to troubleshoot the issues easily. Press and hold the Power and Volume Down button simultaneously for 10 seconds until the device. This is ideal for situations when your device screen becomes unresponsive and you are unable to refresh the display. Turn off the phone, and then press and hold the Volume Up and Power button simultaneously. Release the Power button when the Android logo appears, but continue to hold the Volume Up button. On the Android recovery screen of your device, use the Volume Down button to navigate down to wipe data/factory reset and press the Power button to select it. Turn off the phone, and then press and hold the Volume Up and Power button simultaneously at once. Release the Power button when the Android logo appears on the screen, but continue to hold the Volume Up button. On the recovery screen, use the Volume Down button to navigate down to wipe cache partition and press the Power button to select it. Wait for the device reset to finish and press the Power button when prompted with the message to Reboot system now. Despite being almost 6 months old now, Android 9 Pie is still fairly young in terms of its rollout for Android OEM devices. While Google Pixel series have been running Android Pie since the launch (and facing the gravest issues too), other brands such as Samsung and OnePlus have only just now begun to experience Android 9 Pie issues. While the user forums are being crowded with more and more issues each day, the most common ones have been enlisted above with their respective solutions. Are you among the poor souls that have been ravaged by issues on the latest version of Android OS? If you have a specific issue that needs fixing or have figured out your very own method of fixing a problem with Android 9 Pie, be sure to share it in the comments section below.